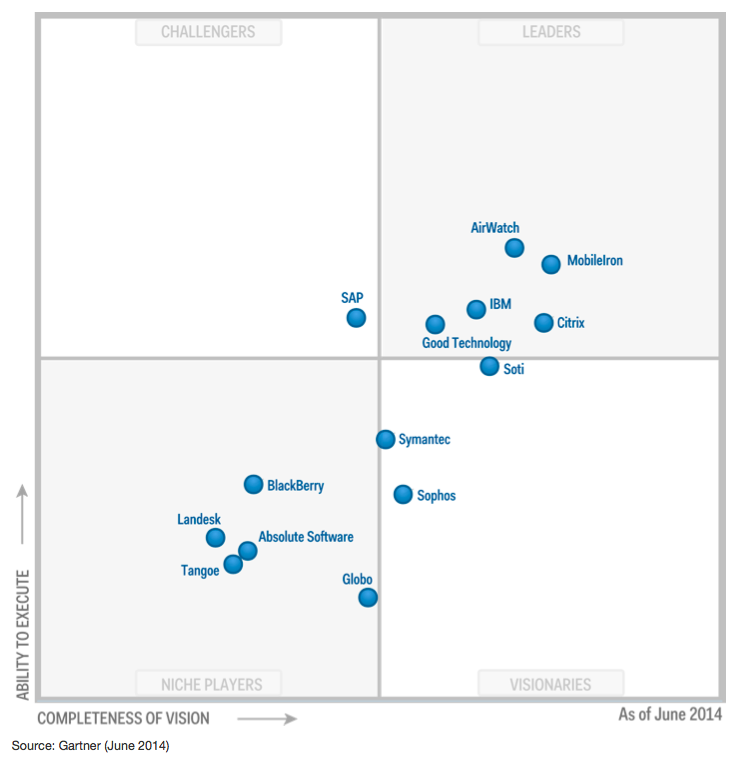 Today Gartner published the 2014 EMM Magic Quadrant. The Gartner named the magic quadrant this year EMM (Enterprise Mobility Management) signaling the evolution of this market from a point solution to a more comprehensive platform play. This is a real important point that companies who are evaluating EMM solutions should keep in mind as they read this report. Building an enterprise-grade EMM platform has really started to clearly separate the vendors who can execute on a platform strategy from those who are cannot. We are very proud of this positioning and as a pure player in this market, we work hard to give our customers the EMM platform they need today and we keep innovating to anticipate our customer’s future needs. The juice is in the details, and I strongly recommend that you read the whole report, which is available by clicking here. This market is clearly becoming a platform play and we believe that MobileIron’s commitment to its eco-system is critical to be successful and provide choice to customers We are not trying to do everything ourselves, we invest heavily hard to enable our partners. The eco-system, combined with Mobile Application Management (MAM) and Mobile Content Management (MCM) define the breath and strength of an EMM platform. While I cannot quote Gartner’s report in here, you should really read the details of what they have to say about our competitors who took a different approach and are trying to do everything themselves. I believe that they are stretching themselves too thin and are struggling to keep up with product quality and market requirements. Do you Want (Mobile) Fries with That? Are you sure? Mobileiron needs to partner with Touchdown, Divide… for a container, both have been recently acquired ! Modern end user computing is about choice. We are committed to our partners and we offer our customers a plethora of applications that are tightly integrated with our platform. Overtime there will be areas that will be composted into the platform itself. By staying focused on the core of EMM we are getting better score on the strategic components such as MAM. Just to clarify Craig’s statement, MobileIron has their own container that partners like Touchdown, Divide and other run within. They do not need a partners container the Mobileiron client is the container. Congrats on hitting the leadership quad again. It is well deserved. That said, what is startling to me is that while Gartner may have titled the MQ “EMM” the evaluation remained largely centered on 2013’s MDM feature arms race. What Gartner should have done is provide forwarding looking value and insight to help IT buyers buy forward. And statements like “mobile application management as a security technology will become less necessary..” especially in light of the ongoing OpenSSL issue. While as I consumer, I applaud Apple’s new Continuity and Handoff features all i kept thinking “there is another leak the enterprise is going to need to deal with” further suggest how idiocy of Gartner’s statement. Despite what Gartner has to say, keep building out your MAM capability..
Any thoughts on the latest SMB-oriented EMM solutions such as HP’s solution, InTune or http://www.bushel.com ? We don’t run into them much. Bushel is iOS only and we live in a multi-OS world. Microsoft is building out Intune. Our focus is G5000.